Absolute pressure is the pressure measured from zero (0) value (absolute zero pressure). P gauge = gauge pressure. So what is Gauge pressure ? let the manometer reads x atm, or x psi, x kgf/cm² pressure at a particular place. so the absolute pressure is the total pressure measured including local atmospheric pressure and extra pressure. This extra pressure is known by gauge pressure. sometime it is vacuum when it goes in negative value from atmospheric pressure. 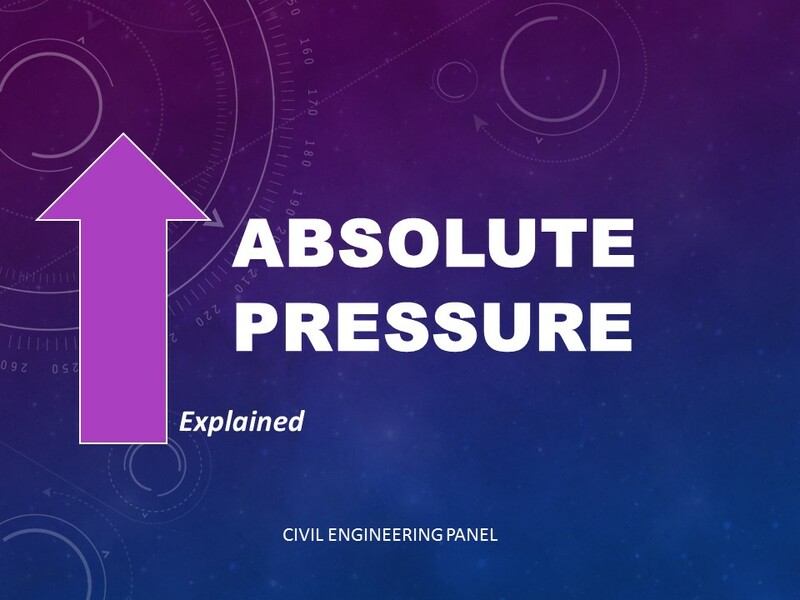 The above diagram of absolute pressure is clearly indicates that the absolute pressure is measured from zero as a datum to its peak point of A. It also shows that the all other pressure is calculated within this range means the absolute pressure is total of all the pressure present. So in case of B point, The total absolute pressure is equal to the atmospheric pressure plus (-ve) vacuum. So what is the absolute pressure’s value ? Gauge pressure is defined as the pressure measured by pressure reading instruments likely known as gauge. Actually gauge measures the difference between the pressure they are measuring and atmospheric pressure surrounding the instrument. That means the gauge cannot measure the atmospheric pressure or the atmospheric pressure is not included in the pressure measured by Gauge Instrunment. So if we notice the reading of gauge as 0 psig (pounds per square inch gauage) in a vessel or pipe, then this is only gauge pressure. If we want to know the absolute pressure in the vessel/pipe, then we have to add 0 psig + atmospheric pressure (in psi).